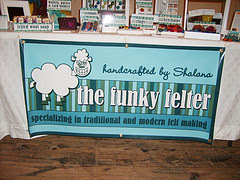 The Funky Felter: My Craft Show Table Display at the West Bottoms Urban Bazaar in Kansas City, Missouri, U.S.A.
My Craft Show Table Display at the West Bottoms Urban Bazaar in Kansas City, Missouri, U.S.A. 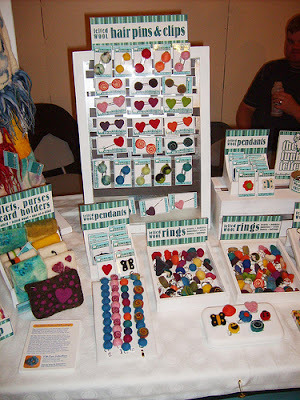 I just wanted to share some photos of my table display at last weekends local arts and crafts event. I've been working hard to make my table display look more professional and less cluttered. 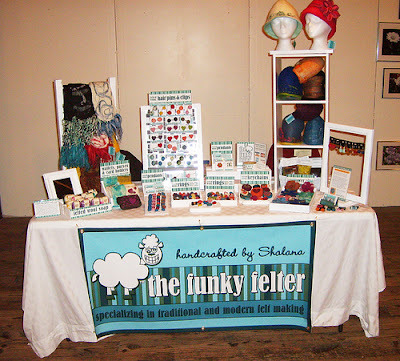 I also had a large banner made of my logo and business name to hang in front of my table. BestBanners on Ebay printed the banner and did a great job! I'm very excited about the upcoming Strange Folk Festival this weekend. My table display almost looks like I want it to. There are just a few more things that I need to work on before I'm completely satisfied . . . Tomorrow I plan to write about some of my fellow vendors at the West Bottoms Urban Bazaar. 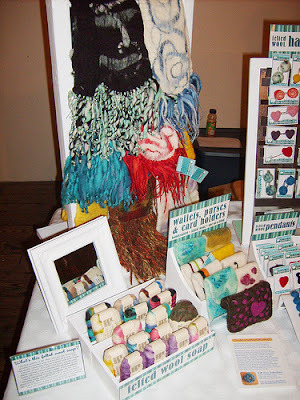 They were wonderful to talk with and have lovely handmade goodies to share so stay tuned for that report! Where did you get your display units? I made most of my display units. I also bought some wooden items at Hobby Lobby. Then I adjusted and painted them to fit.